If you are interested in California banking, especially for savings and checking accounts, you’ll need a list of California banks. 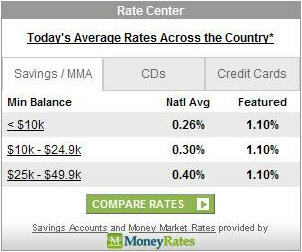 Most California banks have internet sites that allow you to look up the most current bank rates on CDs (certificates of deposit), money market rates, high interest savings accounts and checking. This list of California banks should get you started on your way to seeing what familiar names are available for your California savings. You’ll find some small local banks and some large national banks with branches in California. Remember to check out the bank’s website for the number of branch locations throughout the state, and use our other resources to check out the typical top end bank rates for CD rates and savings accounts. We often have a number of California banks that continually top the charts as paying the highest interest rates all the time and since they are all FDIC protected, if the bank is convenient then all things the same you would probably prefer one that offers you the highest rates and lowest fees. If you become a depositor at some of these institutions, mortgage and loan rates will be lower, too. It’s hard to say which California bank is “best”, but if you get high interest checking accounts and high interest savings accounts and the best CD rates, as well as low interest loans, you’re in the right ballpark.